I have to admit it, I really miss Soft Sky, and I have a stash of it, including a pack of the Love Notes. 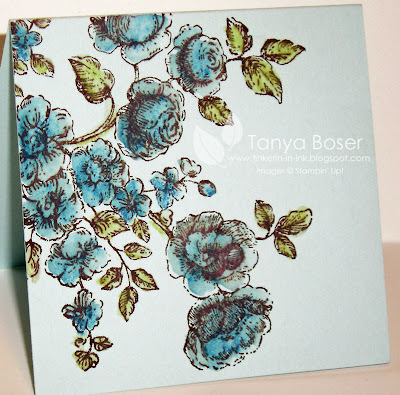 This is another 3x3 Love Note that I made using a set from the Summer Mini that is just so lovely! The Watercolor Wonder Crayons really made this card work. For once I don't feel like I need to keep adding to this card. 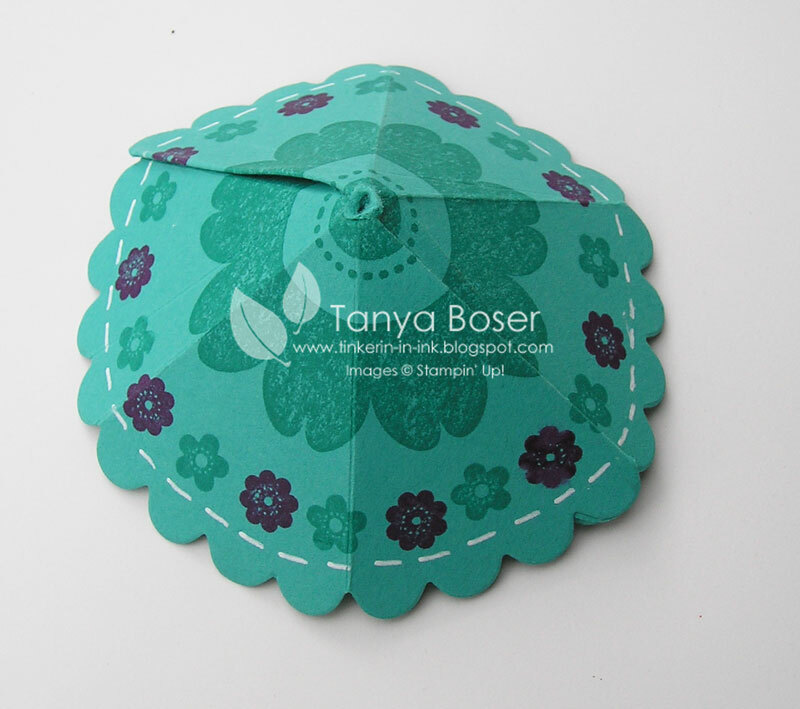 Maybe a sentiment on the Modern Label punch when I decide who is getting this little beauty, and why! I was rummaging through my scrap files and came across a piece of Tangerine Tango that was already wheeled with the Lazy Days JW. 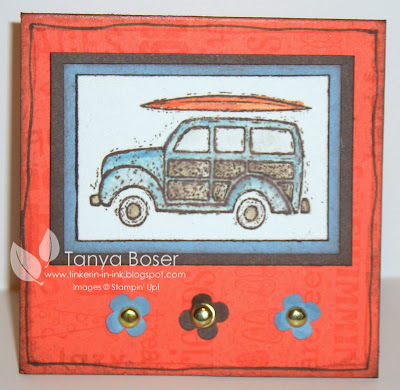 I remembered that I still have this cute set from last Summer's Mini, Just Beachy and I mixed some old with the new and came up with this fun little card! I love the pure summer fun feel to this card and I can see using it for so many different things. 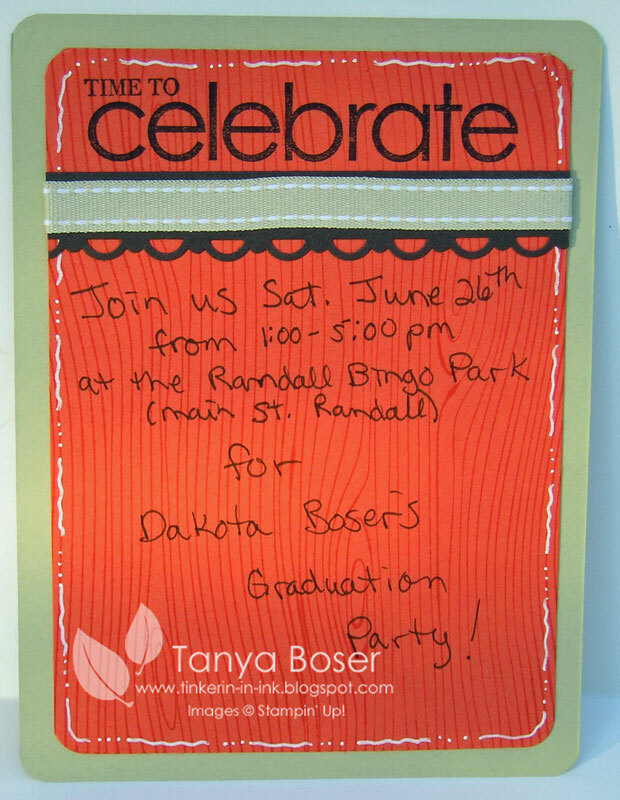 We are gearing up for the big Graduation Party for Dakota this weekend in Little Falls (2-1/2 hours south of us). This is where all of our family is, so it is much easier to have it down there at a community center/park building.... 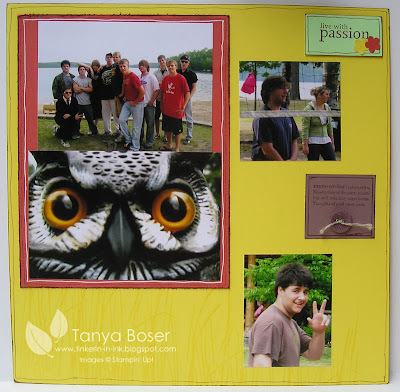 I really should be working on some scrapbook pages and a picture board! Here is a picture of it open. It's a great way to display my cards too! And a closed front view. This picture really caught the shimmer of the Log Cabin Spritz! 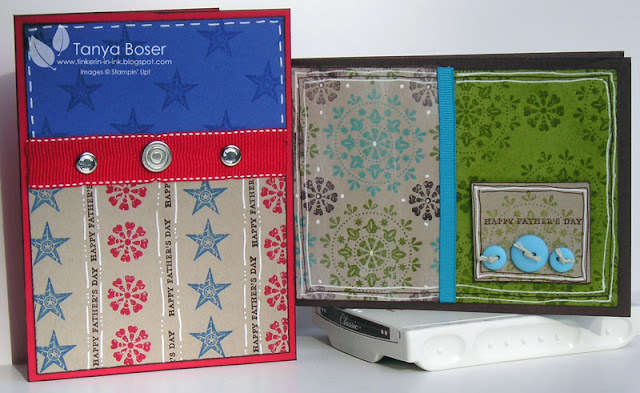 Now, hurry over to my demo site and buy some of these awesome On Board Briefcase Books ( #118766 $4.95- 8 chipboard pages) ! ETA: I adhered the envelopes with 3 strips of Sticky strip in the center of one side of each envelope, then to each other. 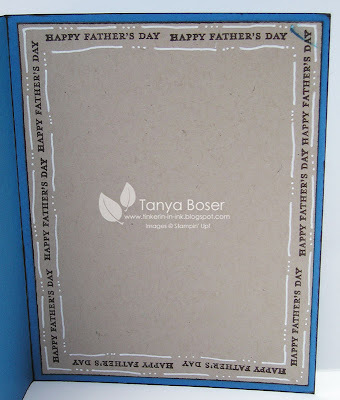 The first and last envelopes were also adhered with 3 strips of Sticky strip to the chipboard. 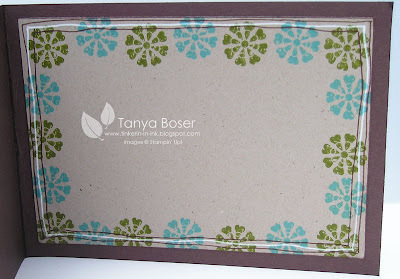 This card would have been in my blog hop post, but we were only supposed to use current products and colors. 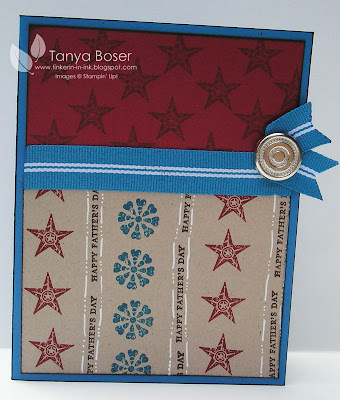 This card uses a returning In-Color (Pacific Point) and one of the new colors (Cherry Cobbler), and it uses a retired ribbon (the striped Pacific Point ribbon) that I still have a full roll of. Yes, I am a pack rat. I can't bear to let go of this yummy stuff! It is actually paying off for me now though, since so many of the old In-Colors are coming back, lol! As you can tell, I didn't do anything special to try to keep my lines perfectly straight and I think it has a country charm to it. And this is the inside of the card. I will put something more personal on the inside when I decide who I will send it too. 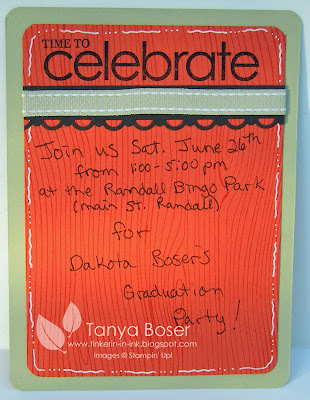 I needed to make some invitations for Dakota's high school graduation party in the area that all our family lives. Soooo, here is what I came up with. 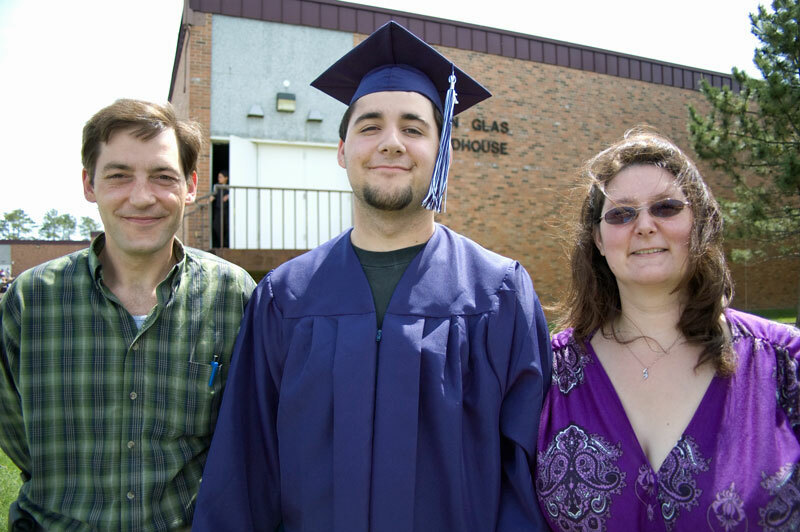 I took the colors from his graduation pictures (which were taken by the lovely and talented older sister, Charlene Boser who is going to college to be a photojournalist!) and got to use some of the returning in-colors! So much fun in one project, I tell you! I also used 2 retired sets, but they really fit the project, so I know you will forgive me :) My stash of retired ribbons and stuff is finally seeing some use. I just love that! This is the back. It's a really good thing I only made these for the special people or I would have been doing these for a month, not 2 days! I hope to have them all in the mail tomorrow. Don't forget to check out the Last Chance lists and make sure you get all those retiring products that you need before they go away! I have discovered the joy of Tempting Turquoise! And guess what?! It goes well with 2 of my other favorite colors ;) Hopefully you won't all be tired of my current obsession with framing everything with markers and white gel pen.... I hope to be using up my stash of Fresh Favorites, Corduroy, and Clear buttons! Why oh why must I hoard these lovely things until they are about to go away? Sigh, oh well. Like it? I do! I wonder if I will remember to mail it this year! 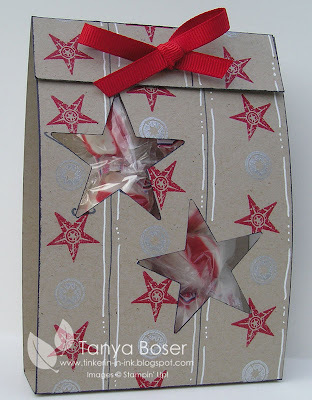 This is the treat bag holder that I made for the Blog Hop last weekend. It is really very easy to make. I promised a tutorial on how to make it so here it is! Cut a 3-1/2 x12" strip of card stock. Punch 2 stars on the 5" section that does NOT have the 1" flap. I punched the stars from each side, not the top. Punch Double Rectangle punch centered on the flep. 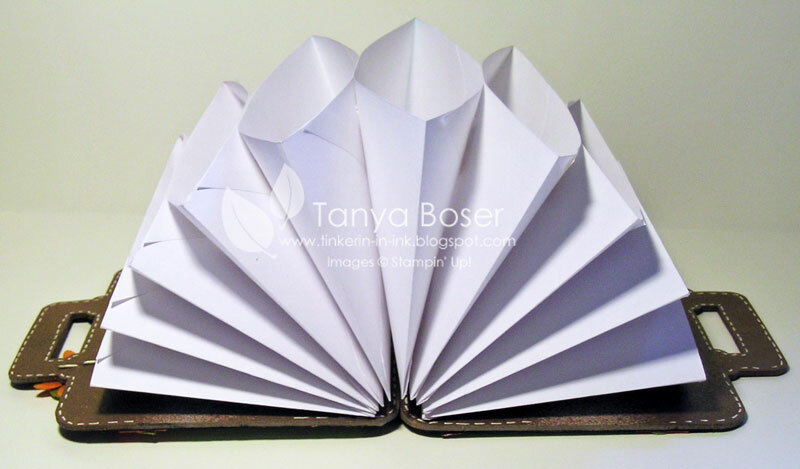 Fold the treat holder together and mark placement of the punches on the 5" section under closed flap and punch out. Use SNAIL to adhere top edge to the inside of the treat holder and fill with candy. Thread ribbon through the 5" section's holes, then through the flap, tie in a bow. All done! If you are following the hop, you most likely arrived here from Heidi's blog where she featured Game Night. Didn't she do an awesome job?! These have the Father's Day sentiment on them, but that could really be changed to just about anything. And as you will see, I am currently addicted to my white gel pen, lol! I also lined these cards with decorated Kraft (soon to be Crumb Cake!) 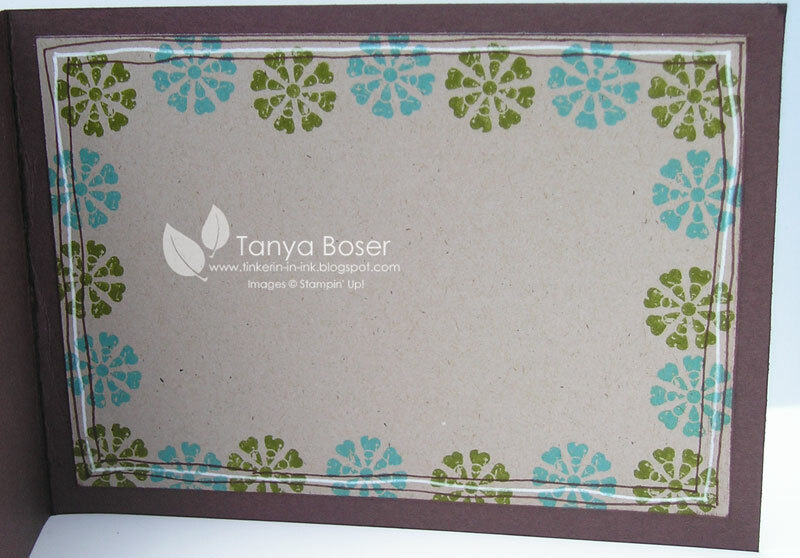 card stock. Doesn't this set make wonderful backgrounds?! I LOVE that about this set! 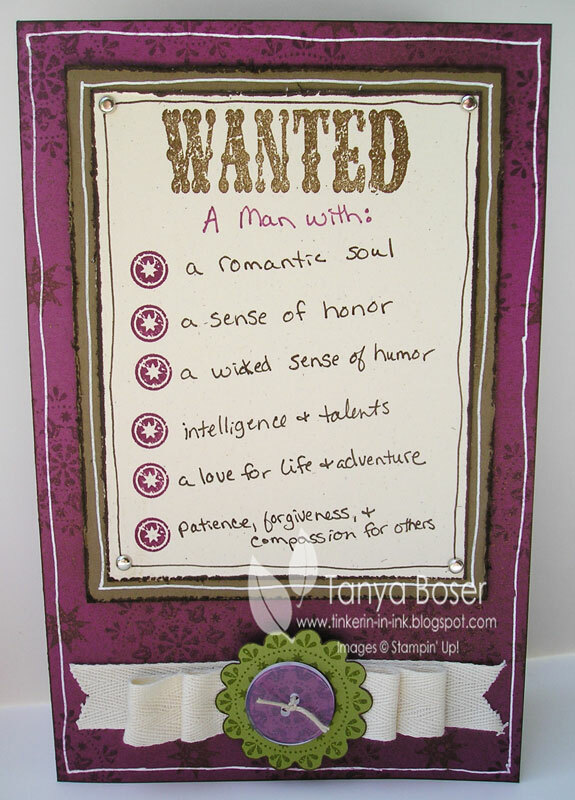 Ok, this next card I made for my hubby for our 20th wedding anniversary, which last week. Yes, I am still crazy about my love :) Life wouldn't be nearly as good without him. Sniff, sniff.... sappy moment here... OK I'm good now, lol. Ok, so after putting the whole card together, I realized that my writing is crooked and I had to squeeze a "c" into "wicked", lol! But I think you have to give me points for bucking up and using my own handwriting! I mean come on, it's not the best you have ever seen, but it is legible. 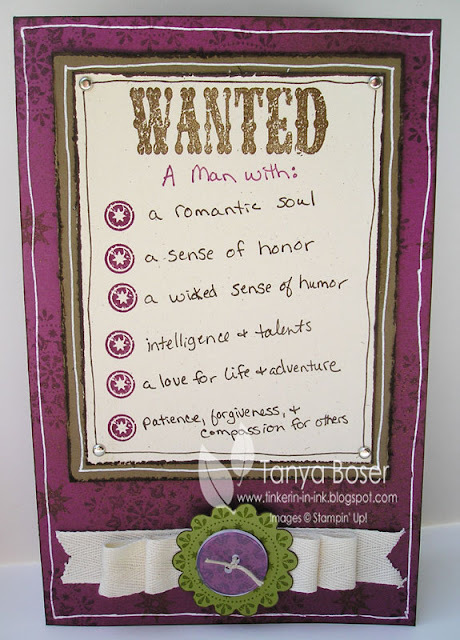 I just hope my embellishment at the bottom isn't to girlie, lol! My hubby did have a big smile on his face when he read it, so he must have liked it. :) I also couldn't resist adding some glitz to this card, I sprayed the card base with Log Cabin Smooch Spritz. This was my first try with that particular ribbon technique. I think I like it! I used up most of my 3/4" Twill tape though! 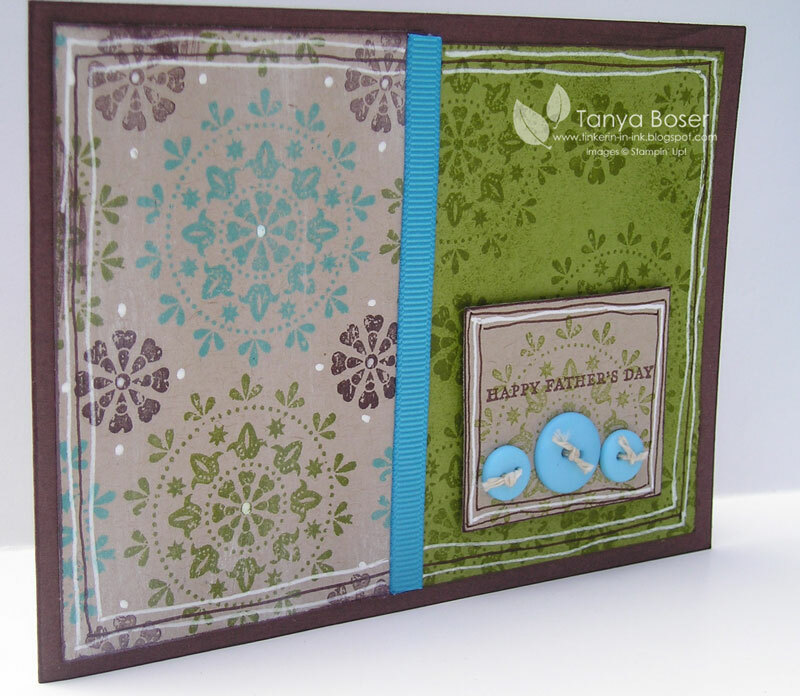 This is a little gift card and an almond can decorated to use as a gift holder (think baby socks or a fancy onsie), or as a shower favor, or a votive candle holder as a baby shower decoration. I bet you all could think of more things to use it for ;) I also used the new Smooch Spritz in Vanilla to add a lovely shimmer to the paper. It is so hard to capture that on film! 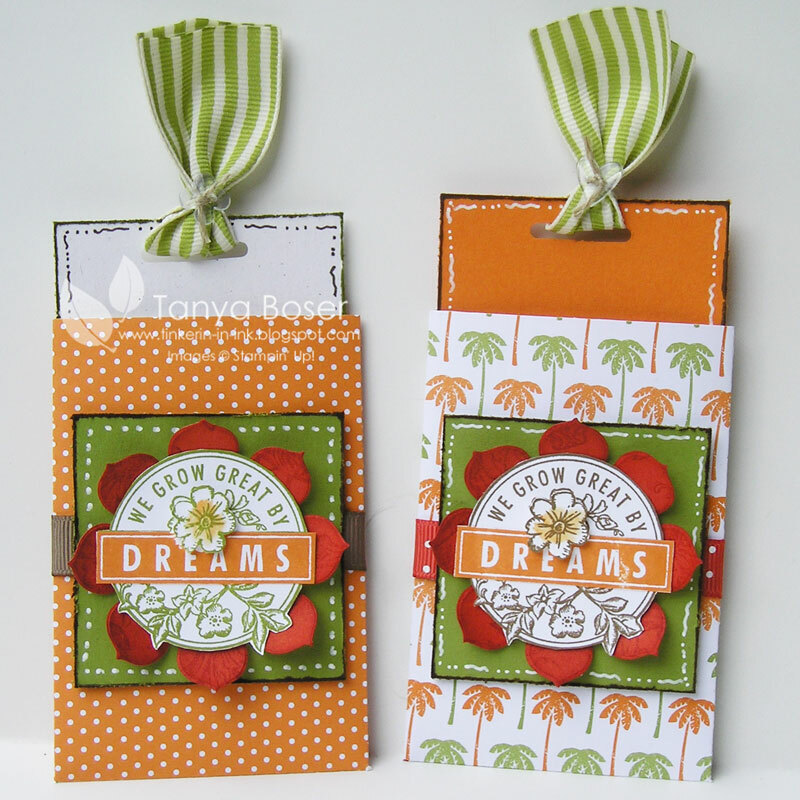 These last 2 projects are a treat bag holder and a 6x6 scrapbook page. The treat holder I made with a 4th of July party in mind. Wouldn't these make cute favors for the kids?! Of course, they will get lots of candy at the parades, but they always want more. I had some Sweet Stripes in the house (leftover from Christmas!) and they actually fit right in with the theme! I used the small Cello bags which are 3x5. The picture on the scrapbook page was taken by my daughter on graduation day for Dakota. We had just eaten our feast of burgers and brats, and everyone was just chillin on the new downstairs deck. Charlene caught David drifting off to sleep, lol! I think it took about 10 minutes to make this page, including the planning! That is record time for me. Really, I mean it! Well, I hope you enjoyed my projects! Be sure to come back later this week for more details on the treat bag holder, and more pictures of the other projects! And don't forget to order your favorite retiring sets by June 30th! Now on with the hop! 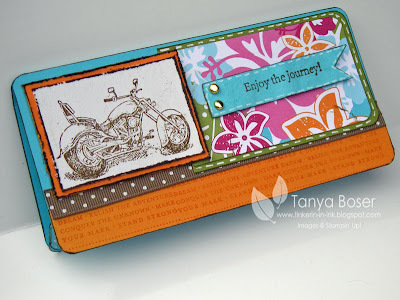 You can continue on to Melina's blog where she is featuring Only Ovals. Or you can go to the Blog Hop thread and hop around at random, it's up to you. Thanks for stoppin', and happy hoppin'! 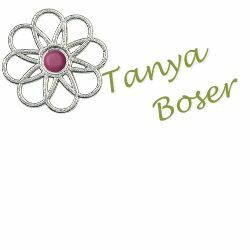 Another Blog Hop Coming Soon! Be sure to join us for a fabulous weekend of projects featuring all those sets that are retiring and you just HAVE to have, lol! You can check out the Blog Roll here. This month, I went a little wild with the projects....we made FIVE! And the amazing thing is everyone was done before 9:00pm! Amazing! 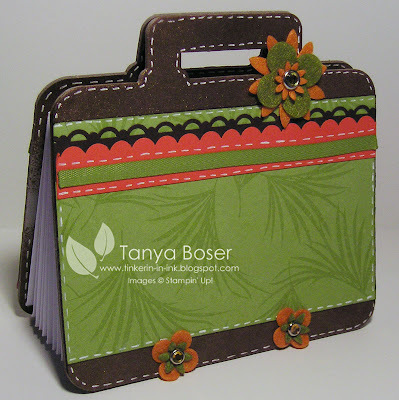 These cute little note cards with their own cute pockets/envelopes were inspired from the June issue of Stampin Success, the Stampin Up! demo magazine. They used a new set from the upcoming catty, but this is super cute too! Ok, I realize this is really bright. In real life it looks much better, but I could not get it to look any less vibrant. These pictures are from last year when the older boys went to Bluewater Bible Camp. They had a great time! I love that pic of the owl, just eye-popping! 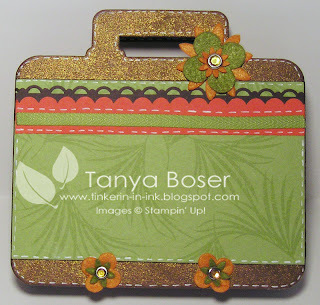 Along the bottom edge, I stamped the grass image from Inspired by Nature in Yoyo Yellow, making it shorter each time I stamped. To me that looks like lake shore reeds and grasses. This is a super cute and fast project! I got the tutorial from Rhonda on her blog here. I used bamboo skewers for these umbrellas. Here we are using some of my almond cans. A 2x11" strip of paper fits wonderfully around these cans! 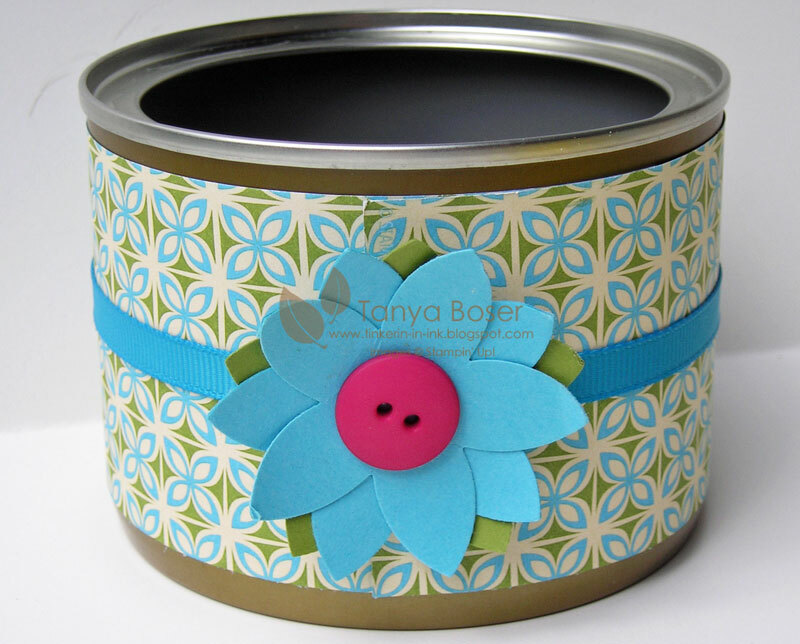 We just wrapped some 1/4" Tempting Turquoise ribbon around the can, secured with glue dots on the ends, and made the flower embellishment with the 5 petal flower punch and Fresh Favorites II buttons and attached with a glue dot! And the last project I have to share is this adorable card! I love this set! I used the Finial Press embossing folder on a strip of Tempting Turquoise and then sponged/rubbed Whisper White Craft ink on it. 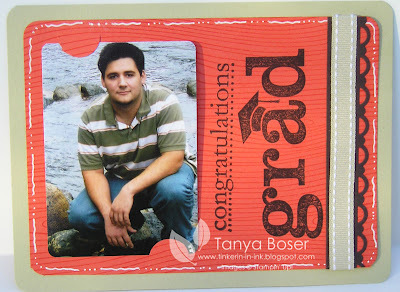 The Kraft card stock on the right of the card is stamped with the border stamp from the set in 3 colors. this was super easy to do with the clear mount stamps! The Bitty Punch pack helped with the flowers in the Old Olive strip. Wow, that was a lot of typing! I hope you enjoyed our projects! We had a grad party to go to this weekend for one of Dakota's friends and this is the card I made for Faith. 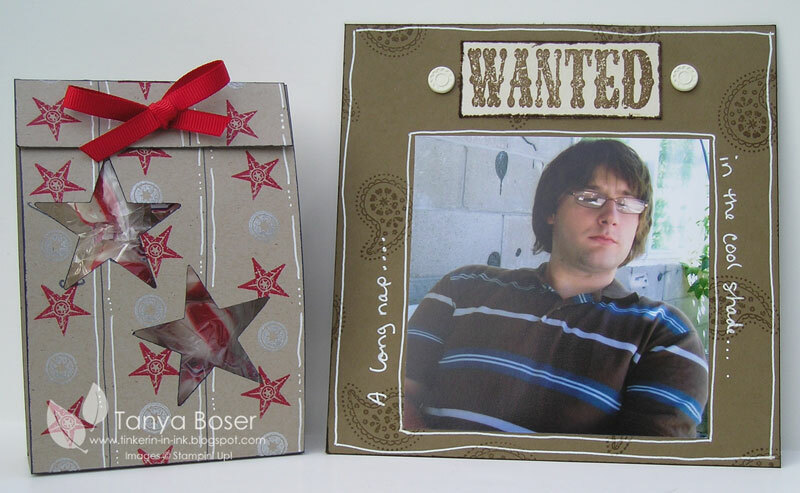 This is a more feminine version of the card I made for the Blog Hop. And I just have to share my amazing plants with you. 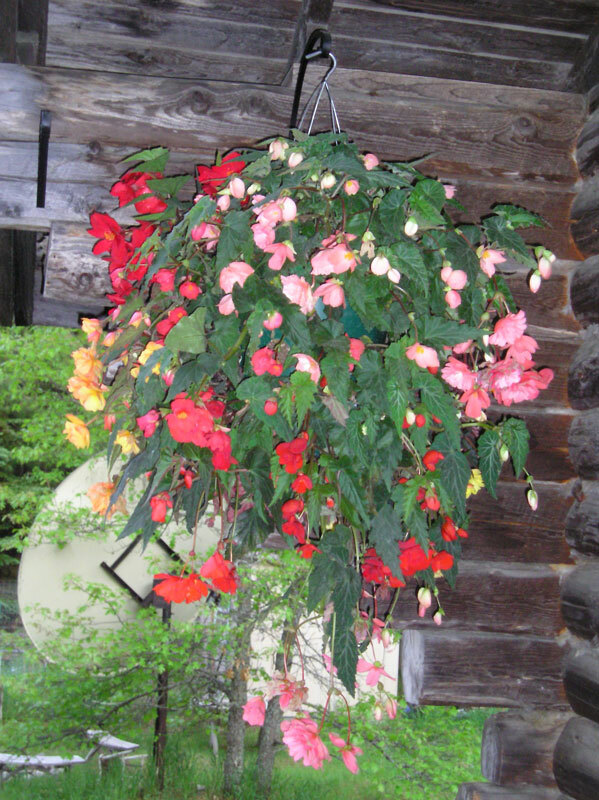 I say mine because I bought it, but the credit has to go to Deer Haven nursery, a small local greenhouse that is only open for about a month in the spring, lol. I hung it in the corner of the house on our upstairs deck and it is so gorgeous I just stare at it sometimes, lol! It will apparently get much larger and form a teardrop. Well, it is a gorgeous day, I'm not working, and I have club projects to plan and cut out, a swap due in TN on Friday, and new blog hop to make projects for! And I just placed an order for the new catalog preview today and treated myself to next day air shipping! I am sooo bad! But I have 3 days off and I don't want to waste any time waiting for my stuff to arrive a minimum of Friday afternoon and I have to work on Saturday! Oh, the justifications I can come up with ;) Just think of the preview projects I will be able to do! Ok, I better get to work on the stuff I need to finish before the new stuff comes in the morning! 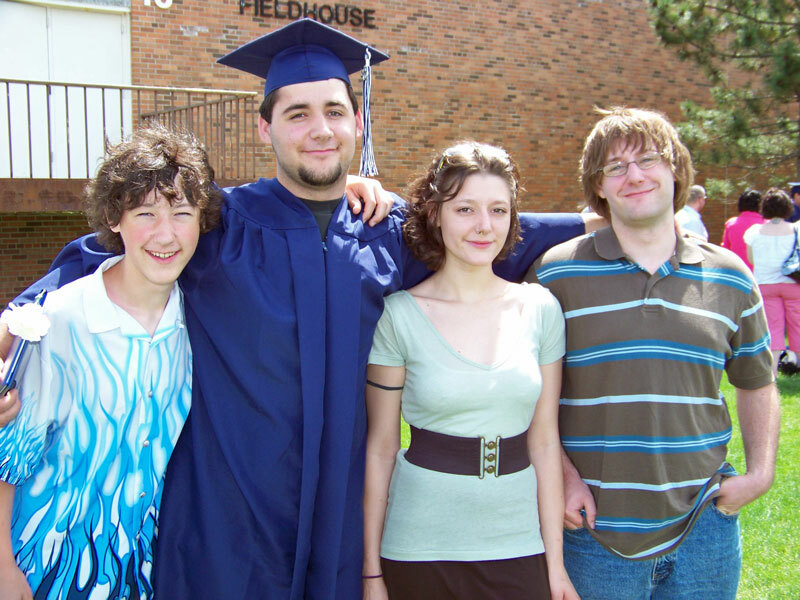 And one of all of my kids together! For those of you who have lived in Minnesota, you will recognize this as a typical Minnesota Good-bye. It takes three times to actually get gone, lol! So here it is- I really must go now!